Funeral Directors and Embalmers in Louisiana are required to complete 4 hours of continuing education every calendar year. Once you pass our course, we will submit your hours to the Louisiana State Board. We report hours on a weekly basis to the Board. 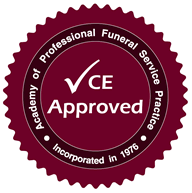 All courses of and/or approved by the Academy of Professional Funeral Service Practice (APFSP) are accepted by the Louisiana State Board of Embalmers & Funeral Directors. All of our courses below are approved by the APFSP.